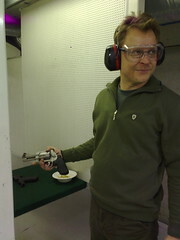 Yesterday was Kimmo’s birthday, and to celebrate he’d arranged that we’d go to a shooting range and fire some guns. We started with firing 50 rounds each with a Glock 9mm pistol at 50 metres range. Then Kimmo got a special surprise – his friend at the range let him fire one shot with the Smith & Wesson 500S revolver, which fires .50 magnum bullets, i.e. half an inch in diameter. Think Dirty Harry, except this was the next size up. Even with our ear protectors, it was very loud – it felt like a firework had gone off next to us. Finally, we each got a chance to fire a full magazine of bullets from a ‘Suomi’ sub-machine gun, an almost legendary Finnish gun from the second world war. It was surprisingly stable – long bursts tended to drift upwards, but short ‘squirts’ of 3-5 bullets stayed very much on target. Afterwards we went to Black Door to tally our scores and have a couple of beers. James joined us there – next time, I think he’ll be coming along to try out the guns. This was my first time ever firing a gun, and I didn’t expect to enjoy it so much – it’s not really my thing. But actually holding and firing the gun felt no more scary than using a powerful electric drill, and it was fascinating to try and hold the gun steady to get the bullets on target. It didn’t hurt that I did better than I expected :-). Eve & I have recently been looking for a new flat – one with the bedroom facing away from the street (or at least to a quiet street), and with a second bedroom to use as my study. Although we love living in Kallio the flats there tend to be one-bedroom or studio flats, and hence most of the flats we visit are in the more expensive Töölö area. Today we saw some nice flats, naturally just above what we’d agreed was our upper price limit. We’ve some thinking to do. 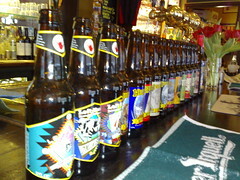 Yes, we all know the joke about American beers, but that refers to the mass-market beers like ‘Bud’. 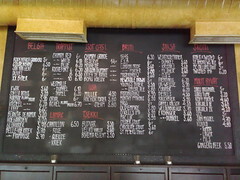 If you get a chance to try these small-brewery beers, don’t miss it!